Members of the Pathshala family have a lot to celebrate. “My son had once written an essay in class, where he wrote that his mother is a photographer,” says Munira Morshed Munni, freelance photographer, photo editor at Drik News and teacher at Pathshala. She is also one of the first students of Pathshala, and has been with the school for the last ten years. “His teacher, upon reading the line, immediately cut it out, assuming it to be a mistake made by the child. Later on, I had to go speak to her and explain that I really am a photographer and also make a living out of it. She was dumbstruck for a while.” You can’t blame the teacher, adds Munni. It is still very difficult for the society to accept this art-form as anything but a hobby, a side interest or a skill that is more or less limited to documenting wedding receptions or capturing nice images. Most people are unaware of the detailed calculations made by the seasoned photographer, of the possible number of angles that can be used for one shot, or the analysis of composition, frame and subject in the blink of an eye. Pathshala, The South Asian Institute of Photography, located on Panthapath, has played a pivotal role in the last decade, in changing the social attitude towards photography as a profession. Offering basic and advanced levels courses in this field, the institution also offers diploma and Bachelor equivalent courses to students. Very soon, a Master’s level programme will also begin in collaboration with the University of Liberal Arts. The school is also a part of the upcoming regional Master’s programme between universities in Bangladesh, China, Indonesia, Nepal, Norway and Pakistan. Back in 1998, Pathshala had begun as a part of a three-year World Press Photo educational initiative in 1998. As the name Pathshala symbolises the ancient education system held in the open air, under the shade of a tree, free from the confining walls of a classroom, the institute emphasised on not merely conventional teaching the students. It allowed students to ask questions and develop their own style and perspective. The school was designed in a way that leads students to experience knowledge beyond the confines of the discipline. According to Shahidul Alam, the Principal of the school and MD of Drik, Pathshala strives to do much more than teach photography. “It is about using the language of images to bring about social change. It is about nurturing minds and encouraging critical thinking. It is about responsible citizenship. In a land where textual literacy is low, it is about reaching out where words have failed. In a society where sleek advertising images construct our sense of values, studying at Pathshala is about challenging cultures of dominance.” Dr. Shahidul Alam speaking on the institute’s anniversary. According to Alam, in the South Asian region, the need for a structured education in photography has always been felt. Since photography plays a significant role in the mainstream media, this need is mostly felt in the field of photojournalism. “The people’s right to information is generally not recognised by the official media in many countries,” he says. “This is clearly also true for the SAARC (South Asian Association for Regional Co-operation) nations. The lack of sufficient professional skills in the media, especially in the field of photojournalism, has also allowed successive governments to pass on propaganda in place of news, and the people’s role in governance has been totally ignored.” Interestingly enough, most students, who go to this school, are studying subjects like Engineering, Medicine, BBA at other universities to comply with the conventional social mindsets. There are some, however, who end up choosing between passion and tradition, hence letting go of the so-called educational system approved by society. One such student is Azizur Rahman Peu, editor of Drik News, teacher at Pathshala and also one of the first students to have entered the school ten years ago. “I was studying medicine in Rongpur,”he says, “when I practically ran away from home to Dhaka. I wanted to be a journalist. Back then, I didn’t know how one would define a journalist. I used to think that a photographer was, obviously, what described a journalist, capturing and documenting moments in history. My love for photography, eventually, led me to start studying here at Pathshala.” Pathshala’s certificate awarding ceremony. 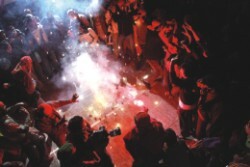 Blaming not only the social net, but also the media in Bangladesh, students claim that even inside newsrooms, photographers are not given their worth. A photograph tells a story as well, which should complement the journalist’s written work, rather than act as a side support. “Newsrooms have news editors,” says Shahidul Alam. “However, the concept of a photo editor is not seen in newspaper offices here.” According to Alam, it was the Independent in the UK which had practically revolutionised the way photographs were used in newspapers, hence breaking the system. “Other newspapers like the Guardian had to eventually accept this idea as well.” Pathshala also has regular academic exchanges between Oslo University College in Norway and Edith Cowan University (ECU) in Australia. It is not really an exchange programme, since students from these countries come to Bangladesh to learn about photography and not the other way around, adds Alam. However, this provides Pathshala students an opportunity to share experiences with students of very different backgrounds. “The long-term partnerships with Sunderland University, Bolton University and the Danish School of Journalism, offer educational opportunities for students with other world class institutions. The internship opportunities at Drik, Chobi Mela and Drik News offer on-the-job training that is invaluable in professional life. The regular participation in international festivals and workshops provide a world-view essential to becoming established in the global marketplace. And then there is the acid test. Emerging students are in demand, and ever since Pathshala started, all students who have graduated are gainfully employed. Some are already at the very top of their profession,” says Alam. Celebrating a decade with fireworks. Norman Leslie, the programme director from ECU, says that his students have had the chance to experience life in all its reality and colours through this exchange programme. “ECU is located in Perth, which is a city extremely isolated even in Australian terms,” says Norman. “Students from this university, besides having the advantages of international exposure through this programme, have also created a certain bond between the two cultures which is extremely important when it comes to the art of photography.” Even though passionate about art and photography from an early age, Shahidul Alam had decided to take up photography as a profession by accident. Back in the 80s, Alam was doing his PhD in Chemistry in the United Kingdom. As was the norm and still is in the society, studying a proper subject define the integrity and depth of being a true man. “And that is what my parents believed as well,” says Alam. “I did not have much money and would work to pay my tuitions.” One of his close friends got into the airlines business and asked him to fly to the United States with him. “A poor student like me would never get this opportunity ever again and so I decided to go. My friend in the UK asked me to bring him back a camera since cameras were cheaper in the US.” Alam got a full set complete with a tripod and lens and got back to the UK, only to find that his friend did not have the money to pay him back. “And I was stuck with it!” laughs Alam. Pathshala recently entered its tenth year. Celebrating the school’s anniversary, a three day festival was organised where both the old and the new students presented their works, amidst other festivities. A photography exhibition titled “Studying Life” began marked the beginning of the festival on February 1 at the Drik Gallery. Exhibiting works by some of the most celebrated students of the school, this event was inaugurated by Atiqul Huque Chowdhury and Dr. Shahidul Alam. The exhibition, which will continue up to February 15, features thirty six photographers, including Munem Wasif, Abir Abdullah, GMB Akash, Tanvir Ahmed and many more. On February 2, certificates were distributed to the students who had finished their respective courses, starting from the basic to the undergraduate level. “We had a full-fledged festival, complete with a winter Pitha Utshob,” says Joseph Rozario, the Administrative Manager of Pathshala. “Students, teachers, along with a few photographers from outside the country had discussions on photography. These photographers also presented some of their unique works. The day ended with a film made by one of our own students,” he says. sua azione abrasiva può consumare lo smalto dei denti compromettendone seriamente la salute.